Chicken stew is one of many comfort foods that I enjoy when the weather starts getting cold. It just makes me feel warm inside and takes all the cares away from my day. It is so good over steamed rice or with crusty bread. A bowl of this stew and a glass of wine is the perfect meal for me while I watch the latest episode of Scandal. The ingredients in this recipe are simple. Find fresh chicken thighs and drumsticks if you can. It makes a lot of difference in overall flavor and taste. I also use the big, bright green Castelvetrano olives which are really good. (You can snack on it while you cook this stew) Aside from their great flavor, the bright green color really looks attractive on the stew. The jar of Castelvetrano olives is available in most supermarkets, Costco or online. For the pineapple, I use Dole canned pineapple slices in its own juices (no sugar added). Just like in any stew, onions and carrots are a must. I added red bell pepper, tomato paste, and fresh thyme to boost the flavor. A tablespoon of flour makes the sauce a little thicker. Start by seasoning the chicken pieces with kosher salt and freshly ground pepper. Next, brown the chicken in hot olive oil. This can be done in two batches. When it’s ready, set the chicken aside on a plate. Then it’s time to sauté the onion, red bell pepper and carrots. After a few minutes, add one tablespoon of flour and let cook for one minute. Stir in the tomato paste. Cut the pineapple slices in half. After that, the browned chicken goes back in the pan with the pineapple and all its juices, olives, and fresh thyme. Season it with more salt and pepper to your taste. Cover the stew and let it come to a boil on high heat. Then lower the heat and let it simmer for about 40-45 minutes. This chicken stew is so easy to make and so worth it. Try it and I hope you like it! 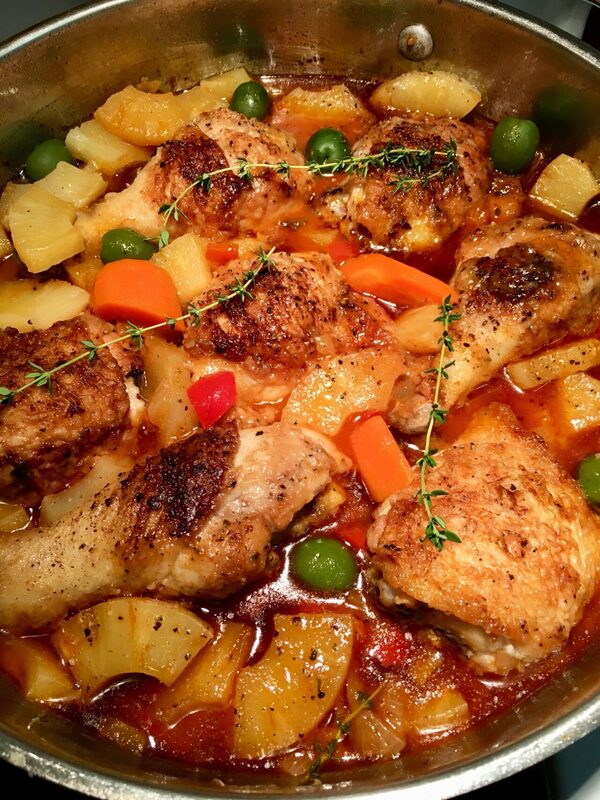 A warm and comforting chicken stew with olives and pineapple is a perfect meal on a cold fall night. Season chicken pieces with salt and freshly ground pepper. Let olives drain in a strainer. Heat up a pan or skillet with 2 Tbsp of olive oil on medium/ high heat. Brown chicken in oil for 5 minutes on both sides. Do this in 2 batches. When done, set chicken aside on a plate. Lower the heat to medium. (Add more olive oil if the pan is too dry.) Saute the onion, bell pepper, and carrots on the pan for 3 minutes. Add 1 Tbsp of flour and stir together. Let it cook for 1 minute. Mix in the tomato paste. Add the chicken pieces in the pan with the vegetables. Add the pineapple slices, all its juices, olives, and thyme. Season it with 2 more pinches of salt and pepper to your taste. Cover the stew and let it come to a boil. Then lower the heat and let it simmer for 45 minutes. Adjust seasoning with salt and pepper to your taste. Before serving, discard thyme sprigs. Serve warm.